Are you looking for the latest and greatest design ideas? Is your time valuable? You’re in luck. Best in American Living has taken one of our most popular sessions at the NAHB 2015 International Builders’ Show® and made it into a fast, fun and rewarding webinar! 2015 Design Trends: 45 Design Ideas in 45 Minutes, Wednesday April 8, 2-3 p.m. ET, is a wow-packed webinar full of easy-to-implement design ideas you can use to update elevations, renew floor plans, animate streetscapes and develop dynamic neighborhoods. Using a wide array of drawings and photos, industry-leading architects, interior designers and builders will show you the newest design trends, products and strategies to capture your buyers’ attention and make the sale. And don’t forget! One low price accesses the webinar for everyone in the office. Register now! Analyze the key market trends emerging in interior, exterior and outdoor living design. Discover tricks of the trade for achieving hot new looks on a tight budget. Identify where to find both the materials and manufacturers to make your vision happen. Get tips on how to satisfy prospective home buyers by understanding their wants and needs. 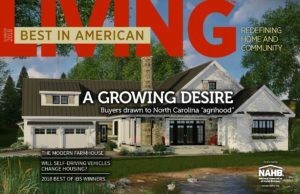 Janelle Brulotte, Quadrant Homes , Bellevue, Wash.
Richard Duncan, MRP, RL Mace Universal Design Institute, Chapel Hill, N.C.
Todd Roy, Progress Lighting, Greenville, S.C.
Tara Ryan, Ryan Young Interiors, National City, Calif.